The Rift has born a new pet into existence! Behold the riftborn kumos. From a safe distance. @Valiska That's literally what I said. I don't want to bash the Kumos or its artist, but this one just isn't as interesting to me visually. And like, that's okay because other people like it instead, but I really hope we get a good mix of them in the future. @Ginseng Porque no los dos? You can have all the cluttered ones, but let there be a few choices like this one for those of us who were hoping that riftborn pets would actually resemble the pets they were before. YES! I LOVE IT! ❤ New goal to be reached ASAP. Wonderful artwork completely encompassing the rift concept without clutter! But srsly tho, if you yeeted (yote? yit?) a pet into the rift and it became an RA-001 or RA-002, but was FORMERLY a Kumos - did it change to the Rift Kumos or stay an RA? Collie looks great now! Thanks guys! They need to have their stars on their body like the true rift -- look at the experiment pet! It's so GORGEOUS and perfect. 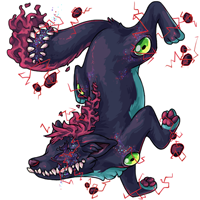 :D It's a mixture of time slime space guts and star specks -- perfection. A Kumos with a mouth? :o love its pink mohawk! I love how its hind legs are sticking straight out on either side. The splayed look is cute. I'm in the odd group out that feels that it's a little plain, honestly. The face and tail are great, the little neon paw pads are adorable, but the torso is just... hm. Maybe that's just a Kumos thing, there's not all that much patterning or visual interestingness going on with their torsos. Still a solid entry though, I can't wait for the Irions and Legeicas! This one strikes a good balance with the rift matter used as accents, rather than clutter to fill out the rest of the frame. Big agree. I've been really excited for rift pets, but I felt like a lot of the ones we've seen so far have been a little too busy and cluttered. Some of them were really hard for me to discern what was going on. Although I'm not a huge fan of how the back right leg (Kumos' right, not ours) is splayed, I like simplicity of this and I hope more rift pets take this more simple approach! The mouth is really cool too! tl;dr the artists are doing great with the lovely nightmare fuel, keep it up! @Amber As our species previously tossed in become available are said pets going to change? For example, I tossed in my nightmare Mortiking and he turned into an 002. Will he transform back into a Mortiking if and when it becomes a thing? I think this is my favorite rift pet so far. I've been looking forward to this color for a long time, but I thought a lot of the pets in the first batch looked too busy, especially with the rift matter everywhere. This one strikes a good balance with the rift matter used as accents, rather than clutter to fill out the rest of the frame. I also liked the ontra and warador, but both could have done with less of that rift matter aura (maybe just shrink the rocks a little?). And then you have the serpenth, which has an incredible design marred by the fact that it has scribbly lightning covering half its body and wings/mane that lack any discernible shape. At a glance it's very reminiscent of slavam (one of my favorite rift things ever), but somehow slavam gets a similar level of detail without feeling so busy. A few minor tweaks and the serpenth would be flawless, in my opinion. I rather like this one, and how it has a rift where its eye and crescent moon face marking would be. This is adorable and I don't even like the Kumos all that much compared to other species. 10/10, good dog, would give belly rubs. I know! Waiting for pets for a new color is torture! I love the rift ontra and kumos but I'm still holding out to see what the other pets look like. I also feel kinda bad for the artists. There's still a lot of catching up to do with other existing colors and now they have one more thrown at them. Nice! Can't wait to see the Fester and Noktoa! Updated my pet color spreadsheet for you guys! So uh, are Loyalty Boxes really supposed so be something you can toss into the Rift? @Aynjell Because it IS a derp dog that tripped and fell onto its face...right into the rift. YESS....... ever since this came out i knew this color would be Perfect for one of my ocs !! i just yeeted it into the rift and i am Very Excited!!! The best part about this new color is that it's literally free to make and looks incredibly awesome. Patiently waits for the Archan ... love the new riftborn - the kumos was super tempting. BTW if you throw a rift pet back into the rift it changes to one of the common forms. My Archan that I threw in was RA-002 went to RA-001 when he went back into the rift. In case anyone is curios. Don't do drugs kids. You'll end up yeeted into a rift. For now, I'm not into the Riftborns. But the Yaherra would be kinda interesting. So. Many. Eyes. Very nice! Now, what would a rift blob look like?!?! I'm really hoping you guys continue using site-specific aesthetics for new colors! I'm disappointed that the crescent moons are not there or are erased. Other specialty colors have preserved this in the Kumos. I love it and I need it. He's beauteyful! I like how his scruff/mane kind of looks like... coral? This suits the Kumos I have for my RL dog much better than Sweetheart. *gives it a belly scratches* "who's a good pup?" "Yes! YOU'RE a good pup!" Niiiice! Now that's a rift pet! Easy on the eyes despite being an eldritch abomination. Now THIS is a good boy. Didn't want a kumos before. Kind of want one now. :o Very awesome! Yes, yes that is exactly the right number of teeth. 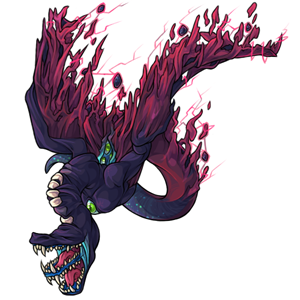 I made my pet Juulius a rift ontra now i have no idea if I want him to stay ontra or be Kumos! They’re both so cute!!! I never noticed that Kumos only have three toes, until now. As do all the other pawed pets apparently... except the Ontra. Lucky Ontra. I love how his back legs are splooting lol! what a great doggo! The kumos is great, but wHaT aBoUt ThE kUmOs ? Also you guys should have a <3 button for the actual news posts and not just our comments so we can show our love through that too! This looks rather fab! Tempted me is tempted to get this pet. Hahaha, I love that grin. Or should I say, those grins.